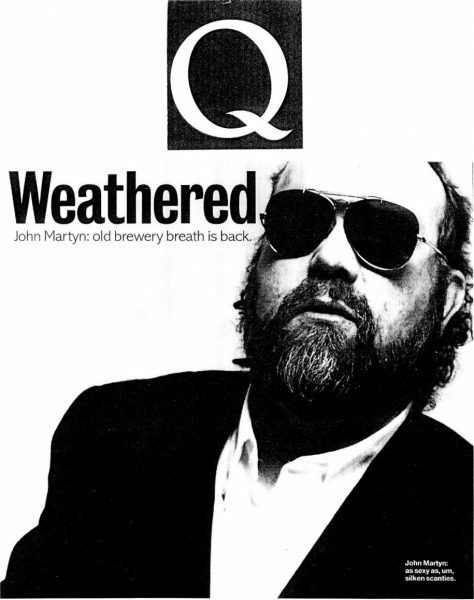 John Martyn: Old Brewery Breath Is Back. He may be 30 years in the business”, 25 albums down the line, and possessed of all the fans his idiosyncratic body of work is ever going to attract, but And. finds John Martyn still out there trowelling on the fuddled charm for anyone who might prove susceptible to his peculiar ways. He makes his pitch in the opening track, Sunshine’s Better. Despite co-production in America with “young hip hop engineer” Stefon Taylor, there’s no high-five and “Yo! Chill out!” greeting. Instead, as ever, he murmurs, slurs, so intimate you can almost smell the warm brewery breath. His theme: Life, Love, funny old game to be sure. He muses, “If you take my money, if I take your liberty …” It does not, as they say, augur well. A piano quietly ponders, strings sigh, a sax goes where its fancy takes it: ensemble they smooch, they “groove”. What Martyn gives of himself is the weathered warrior, who still can’t work it out and has kiboshed anticipation of ever finding what he seeks but hasn’t stopped caring. This bruiser’s gentleness is the album’s familiar foundation. It’s even there when he’s obsessing about former lovers, Suzanne and Carmine, or tormented by gossipmongers in Who Are They? (“Tell me what do they say… about you and me?”). Although the thoughts and sounds are dark — especially some skin-prickling keyboard “strings” backdrops — there’s a core of calm acceptance defying vicissitudes. Contradictions are OK when your thesis is that nothing makes sense. The Downward Pull Of Human Nature reflects bleakly on all manner of everyday turpitude (“Did you ever look sideways at your best friend’s wife?”), without dispelling the comfy ease engendered by Martyn’s conversational delivery and the jazzy drift of his band. The weird girl in A Little Strange is fondled and flattered by a sinuous double bass and Martyn’s insouciant assertion that “I would walk a city mile just to see that silly smile”. She’s more worth than she’s trouble. How nice. Really.